Last night, I Febrezed my hair. In case you're wondering, it didn't work that well. For the first time in years, I sort of watched the Super Bowl last night. By "sort of," I mean I went to Diesel Filling Station with a few friends, and we ate dinner and chatted while the game was on in the background. I didn't realized Atlanta bars still allowed smoking inside, and I was too lazy to wash my hair at night, so I tried Febreze. I was hoping it'd be a great Spinster Hack I could impart to all of you, but I must tell you it's really not worth your time. 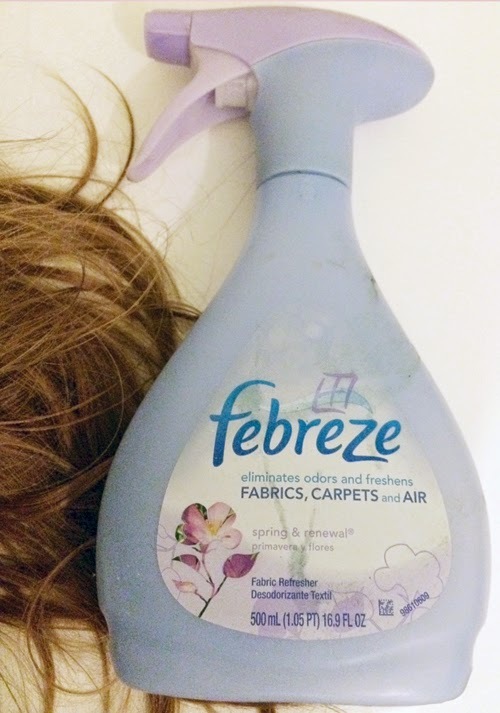 I had thought I could even change the wording on the bottle to say "eliminates odors and freshens FABRICS, CARPETS and HAIR." Sigh. Now, let's talk about the halftime show. Because, let's be honest. In a football game, all I care about are the cheerleaders and the halftime show. I didn't see much of the cheerleaders, so halftime it is. Katy Perry was...less exciting than I'd hoped she'd be. I wanted more dancing out of her. Then there was Lenny Kravitz who had a little trouble with the lip syncing. THEN, though. Then there was Missy Elliott, and she brought the house down. At the time I'm typing this, there aren't videos up yet, but I'll come back and that later. For now, though, let's look at what really matters: The Kitty Halftime show from the 2015 Puppy Bowl. OK?